I don’t know about you, but our mornings are often chaotic trying to get one or two little ones off to school (depending upon the day) and my husband out the door to work. Luckily I don’t commute very far to work most days! But having time for more than a quick breakfast on the run can be difficult some days. And truth be told, it is generally the days my husband has to drop my son at school that are the most challenging. More often than I care to admit, Cheerios and a glass of milk are eaten in the car. At least it is something and his daycare gives them an early morning snack not too long after he arrives. And the other days of the week where I do the driving, we generally have more time for a real breakfast. But I know we can do better on the challenging days. It just takes planning and cooking in advance to make more breakfast items ahead of time. Some weeks this is easier said than done. 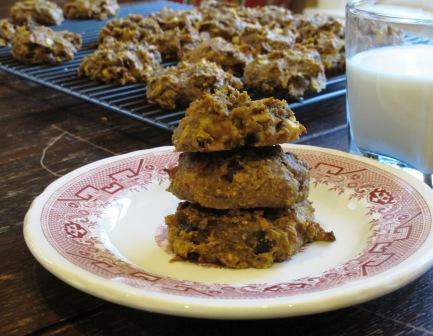 I have long toyed with the idea of creating a breakfast cookie and finally I did just that! And these are wonderful for any time of day really. It is more like baked oatmeal that happens to be in a cookies shape. Best of all, they are super easy to throw together and my children enjoy making them too. They also enjoy eating them fresh out of the oven! As you gear up for holiday baking, why not surprise some friends with a nutritious treat that can double as breakfast because we know that everyone has those mornings! Enjoy! 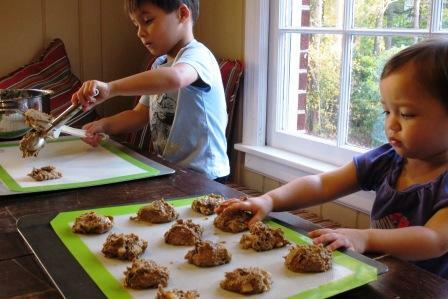 More like baked oatmeal in a cookie shape, the whole family can enjoy these for a quick breakfast on the run or a snack. This is a versatile recipe and you could swap out the pumpkin, apple and raisins for other additions if you prefer. 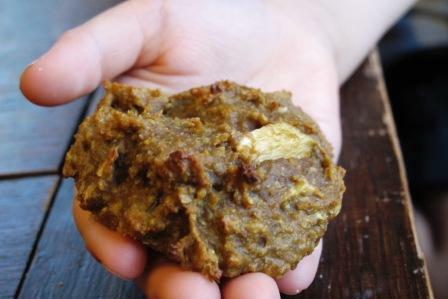 In a large bowl, combine the oats, flour, flaxseed, baking powder, salt and pumpkin pie spice. Add the remaining ingredients, one at a time, stirring well after each addition. Spoon onto a sheet pan lined with a silpat baking mat or parchment paper. Bake at 375 degrees for 8-10 minutes or until lightly browned and cooked through. For a finer texture, run the oatmeal through a food processor. If you are using regular oats rather than the quick cooking ones, you definitely want to run it through a food processor first for a better texture in the finished product.